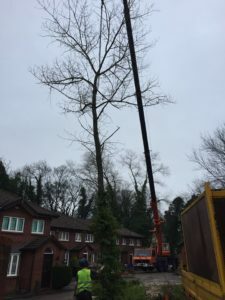 There are many elements of the tree surgery trade. Each of which allows individual companies to provide a valuable service for both domestic and commercial clients. Individuals often consider it to be too much of a dangerous task take on themselves. It is, however, pivotal that every element of the provision is taken seriously. This includes safety and consideration of impact on local dwellings. We have put together the following information to show what makes the difference so that we stand out as professionals. 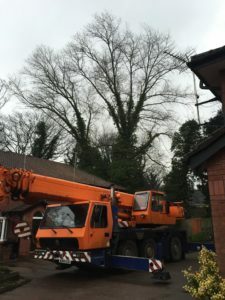 Each of these elements helps to provide our future clients with assurance when selecting a Company to complete their tree surgery work. When you are hiring a company, confidence in your selection is incredibly important. These images show a job that completed in Wilmslow. 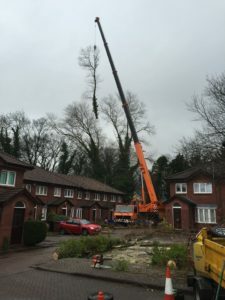 The trees had become incredibly unmanageable and our clients needed help to transform the plot. The series of pictures show the machinery required, the work involved and in fact, the incredible result achieved by our skilled staff. The location of some trees is sometimes very challenging. 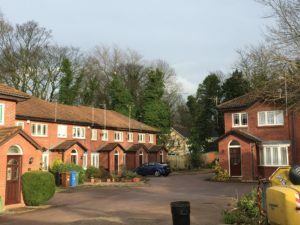 There are many elements that need to be considered including public pathways, dwellings and tree protection orders. It may be that the problem trees are on an area fall on local council land. We work with our clients to ensure that the best result with minimal disruption to their daily routines. 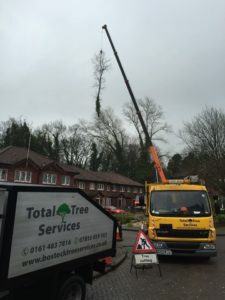 If you would like to enquire about our services, please call today on 07855 859983.